I had my tail handed to me on a platter by Snookums' mom while playing scrabble on Thanksgiving. I played her twice and she beat me like I'd stolen something. I believe that she beat me by more that 200-300 (I can't remember how much...I blacked out after the second beating) points in both the games we played. After getting beaten so badly, I went and told Snookums and his father about how badly I'd lost. His father asked me, "Did you expect to win?" Oh, did I mention that Mama Snookums plays in scrabble tournaments? I didn't have a chance in hell. Well, I KNEW I wasn't going to win. But I didn't realize that I would lose so badly. I'd been playing scrabble online at scrabulous.com, so I thought I was getting some scrabble muscle. Um, it wasn't enough. See that camera? 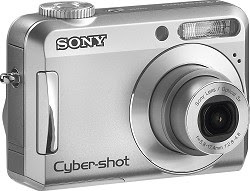 7.2 megapixels, 3x optical zoom, and a faster shutter speed than my Canon. It was a surprise gift given to me by my Snookums last night. He knew I wanted this camera for a very long time and was able to get one for the both of us on Friday. I love him. 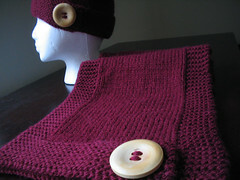 ...from the winter issue of Interweave Knits. Well, needless to say, a sistah wasn't mad anymore when he whipped that camera out of his coat. I didn't want yarn after that. I just wanted to play with my camera. I finished the toddler sized Republic. I'm quite fond of the swirl top on the hat. 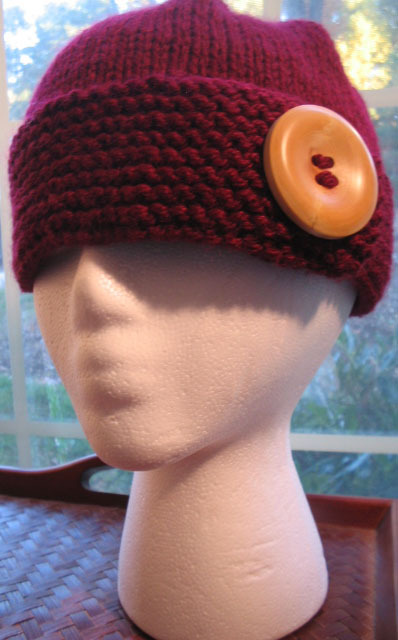 I try to incorporate it in all my hats, if the pattern allows. 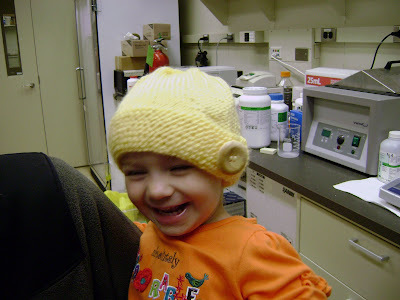 And here's Jilli, my coworker's daughter, modeling the hat. Look at that grin! She's the cutest thing EVER. It's hard to get a non-blurry picture of a moving toddler. I should have increased the shutter speed on the camera.